As Pain Awareness Month (September) comes to a close, we’re exploring how pain is subjective, and expressing it using the classic 1-to-10 or “smiley face” scale can be tricky. What are the shortcomings of these scales? And what can help you communicate better with your doctor? 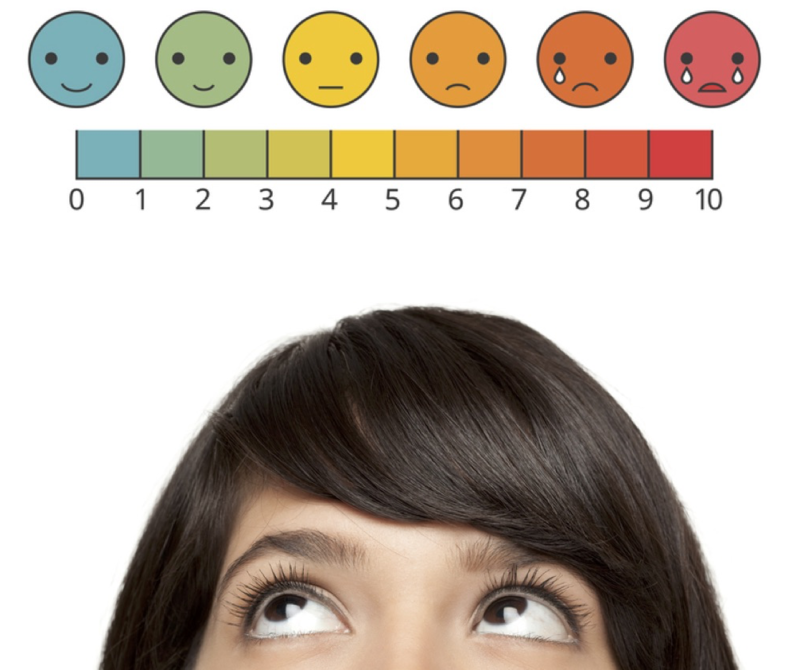 Face scales – The well-known Wong-Baker FACES pain rating scale was originally created for children, but it’s still widely used for all ages. Not everyone can equate their pain level to certain emotions or facial expressions. For example, some people with autism or chronic severe pain may not understand which face to choose – if I’m not crying, is my pain not severe? Adam Rosette, a 33-year-old who had surgery to remove multiple benign brain tumors, tells NPR he wonders if he “low-balled” his pain while in the hospital. “I don’t think I ever answered higher than a ‘7’ because an ‘8’ would be, in my mind, like I’m missing half of my body or a limb,” he says. In the PatientsLikeMe Chronic Pain forum (psst, join our community for link access), members have talked about the challenges of discussing pain with their doctors. Some say that pain management is a tough topic these days because of fears surrounding pain medication dependency and the opioid crisis. U.S. experts in pain management are working on new ways to assess pain levels more accurately. Some researchers are even developing devices to measure pain more objectively. Get “a little more flowery,” pain management specialist Dr. Chrystina Jeter says. It’s OK to go beyond a pain scale rating and describe your pain as aching or burning, or to compare it to the worst pain you’ve ever felt, such as kidney stones, childbirth or a surgical wound. Portray your day – explain which times of day or activities are most difficult for you, and get specific about how pain has impacted your ability to function (for example, ‘I can no longer chew, run, walk, get out of bed, etc.’). Hint: Tracking how you’re feeling every day on PatientsLikeMe can help you remember the details at your next doctor appointment. Go into your history, including how long you’ve lived with this pain, what other treatments you’ve tried or considered, and even your family history of pain sensitivity (which is inherited, pain specialist Dr. William Maixner points out). How do you convey pain to your doctor or care team? Join PatientsLikeMe or log in to connect with other members on this topic in our forum. Pain scales aren’t very efficient as pain, while constant and chronic, is also transient. I might be at a 9 and then a 5 in the course of an hour without treatment. It can also ratchet it back up just a hard and fast as it went down. Doesn’t mean I’m not in severe pain. Also, as I have lived with chronic pain my entire life )not an exaggeration) I can be in extreme pain and still be functional as I’ve never known anything different. You don’t just stop living.